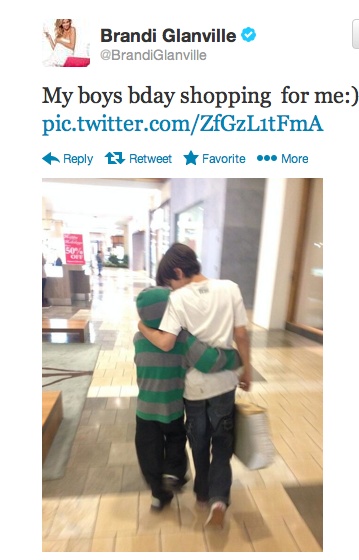 Brandi Glanville posted a sweet tweet [below] of her sons at the mall, as her 41st bday is on Novevember 16. No big deal, to normal human beings. But LeAnn Rimes isn't normal. She's a mentally ill person who needs professional help. She's stuck in Taipei, Taiwan, right now performing for five people who lost a radio contest because they couldn't do a Rubic's cube while blindfolded. LeAnn Rimes is seething over this tweet. When she returns she will tweet something about how Mason and Jake made/did/bought something for HER. Maybe it's a "Welcome home" sign, a cake, or a festively gift wrapped box from Neiman Marcus since Brandi's gift obviously came from the 'lower end' Nordstrom. Whatever the gesture, it will be in the 'so sweet, look what we came home to' vein, to show how much SHE is valued in their lives.